The design of the F8 is highly favored by professional cyclists such as Chris Fromme and the Sky Team. 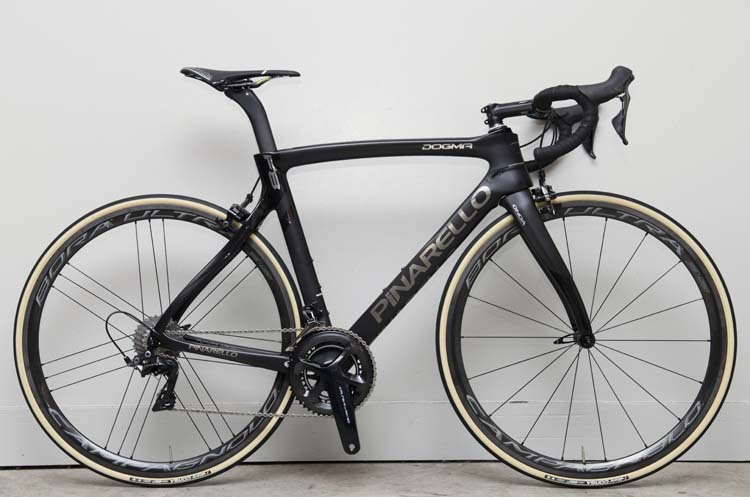 As an eighth generation design of the Dogma, the F8 was actually created in collaboration with Pinarello LAB, Team Sky, and Jaguar. With improved aerodynamics, asymmetric balancing of the frame, lower frame weight, superior lateral rigidity, and vertical compliance, this model is simply one of the best cycles ever made. While it seems nearly impossible, the aerodynamic footprint of the Dogma F8 was streamlined by an incredible 47% since the Dogma 65.1. The asymmetric frame design counters the pedaling forces of the drivetrain in order to deliver superior power into your ride. The F8 is 16% more balanced than the 65.1 design and is 33% more balanced than your high quality non-asymmetric frame. The frame is made with the new T1100 1K Dream Carbon with Nanoalloy Technology. 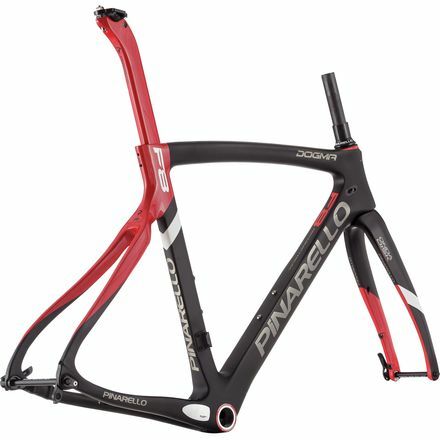 Pinarello’s carbon partner, TORAY, actually granted Pinarello with the sole rights to use this frame material and technology. What is absolutely incredible is that until this point, this carbon used to make the F8 frame has only been available for high end aviation projects. 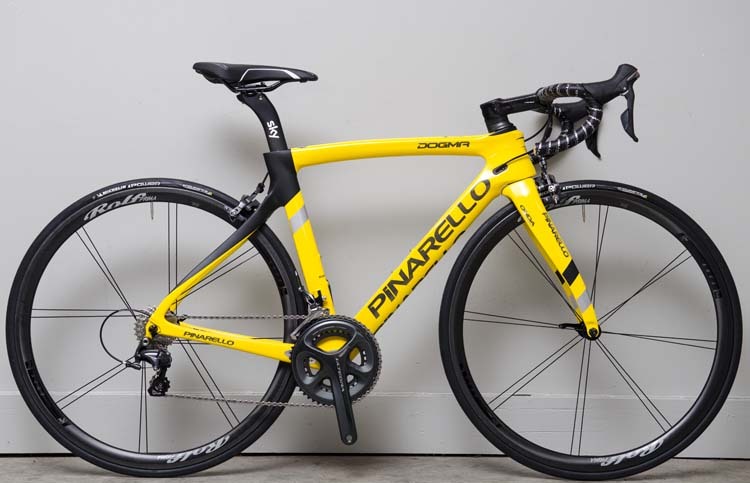 This made the Dogma F8 by Pinarello the only bike in the world to be built with the T1100 1K carbon. 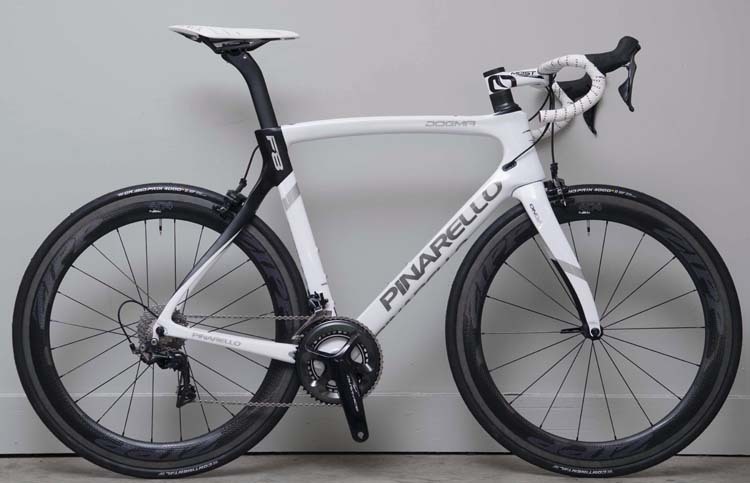 This was so popular among pro cyclists and time-chasers, that the 2017 Pinarello Bolide TT Carbon Time Trial Bike used this same material for their frame as well. You can view the review in our article below! 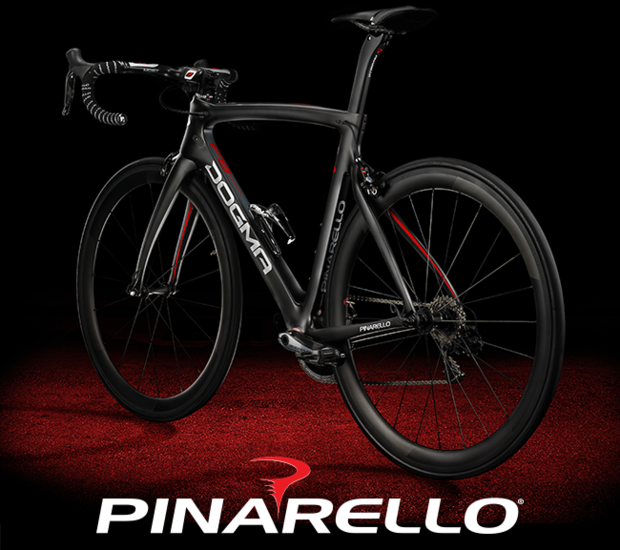 Pinarello’s Think 2 design allows riders to run either electric or mechanical internal cable routing simply by switching out the cable stops going into the frame. Each frame comes with both of these options. You can purchase your F8 in a variety of specifications. 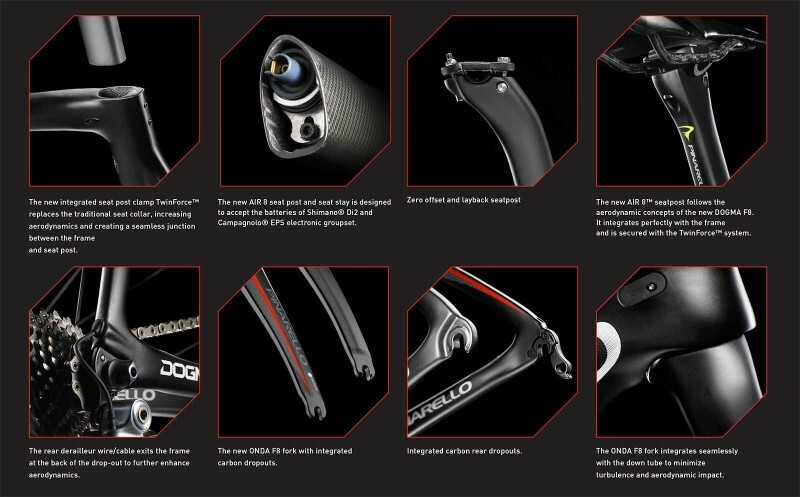 Shimano is king of the Pinarello Dogma F8, however. From the brakes, brake shift, cable, housing, crank, bottom bracket, front derailleur, rear derailleur, cassette, to the chain, you can have your F8 feature the best of Shimano components to more affordable or lightweight Shimano parts). Shimano Dura Ace R9100, Shimano Dura Ace 9070 Di2, Shimano Ultegra 6800, and even SRAM component parts are very popular for this model. In the end, after assembly of your bike and all components, the F8 will weigh around 15 to over 16 pounds. The combination of the F8 design and the exclusive use of the carbon for this premier bike, the Dogma F8 is much lighter than its predecessor, the 65.1. 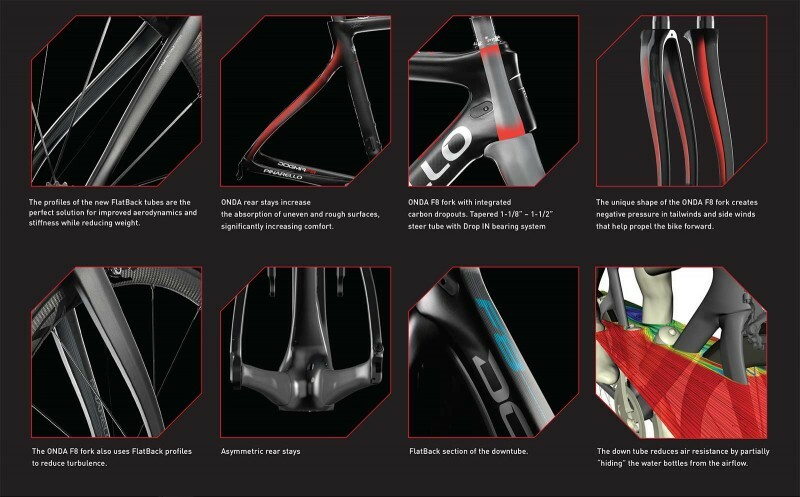 The Dogma 65.1 featured a Torayca 65HM1K frame, which weighs 940 grams (in a size 54 frame), while the same size frame is only 860 grams with the aviation grade T11001K carbon fiber. When it comes to drag, the ONDA F8 fork got a remodel and improved aero efficiency in the front and center. This resulted in an incredible 54% reduction in aerodynamic drag and 10% reduction in weight from the previously used ONDA 2. In addition, the use of the FlatBack tube was ingenious. This resulted in much better aerodynamics and aided in both lateral stiffness and weight reduction. This means the F8 is more responsive to the riders’ movements and offers more complete control. Sizes range from 42cm CC Sloping (TT 49.80cm) to 62cm CC Sloping (TT 62.00cm) and there are nearly 25 color options. 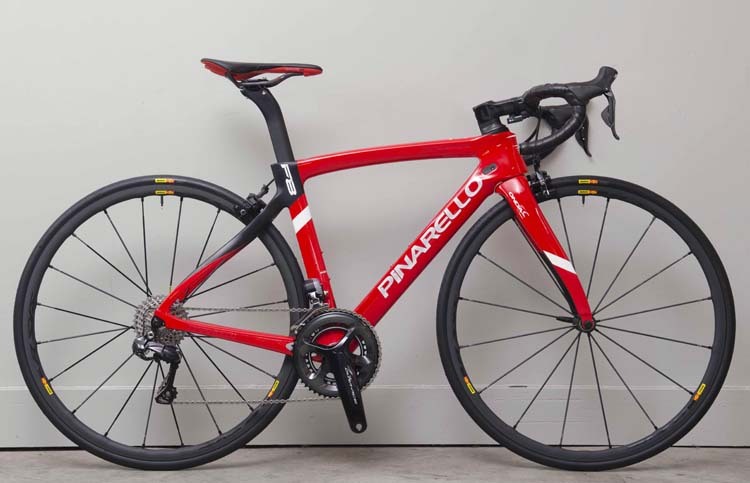 The frameset of the Pinarello Dogma F8 (2017 model) retails for around $5,750. 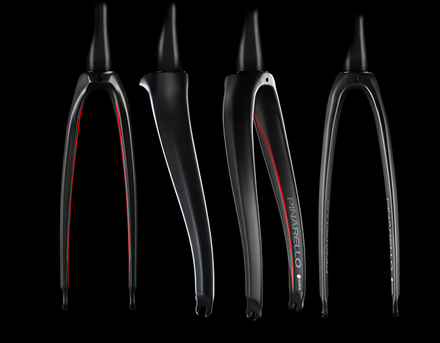 Remember, this is just the T1100 1K carbon frame. All component parts cost extra.